Background: Secondary lymphoid organs (SLO) are distributed in many districts of the body and, especially, lymph nodes, spleen and gut-associated lymphoid tissue are the main cellular sites. On the other hand, tertiary lymphoid organs (TLO) are formed in response to inflammatory, infectious, autoimmune and neoplastic events. Developmental Studies: In the present review, emphasis will be placed on the developmental differences of SLO and TLO between small intestine and colon and on the role played by various chemokines and cell receptors. 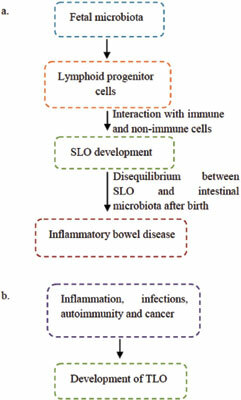 Undoubtedly, microbiota is indispensable for the formation of SLO and its absence leads to their poor formation, thus indicating its strict interaction with immune and non immune host cells. Furthermore, food antigens (for example, tryptophan derivatives, flavonoids and byphenils) bind the aryl hydrocarbon receptor on innate lymphoid cells (ILCs), thus promoting the development of postnatal lymphoid tissues. Also retinoic acid, a metabolite of vitamin A, contributes to SLO development during embryogenesis. Vitamin A deficiency seems to account for reduction of ILCs and scarce formation of solitary lymphoid tissue. Translational Studies: The role of lymphoid organs with special reference to intestinal TLO in the course of experimental and human disease will also be discussed. Future Perspectives: Finally, a new methodology, the so-called “gut-in-a dish”, which has facilitated the in vitro interaction study between microbe and intestinal immune cells, will be described. Innate lymphoid cells, microbiota, polyphenols, secondary lymphoid organs, tertiary lymphoid organs, vitamins.